For years I resisted making a video for children. The whole point of my songs is for the teacher to interact with the children, look them in the eyes, and enjoy a special time together. That is still critical to me. However, I have received so much positive feedback about my “Better Bodies and Brains” DVD that it might be time to make another one. When I first watched that video I was embarrassed. I did not like looking at myself, and I thought it was corny. The bottom line is the kids LIKE it. So there! (They think I’m flying like an angel because of the blue background. Some of them wonder why I wear black all the time. I get some really cute comments.) But, let me tell you the real reason this DVD works. There are times in the day when you would like to put your class on “pause.” You’ve got to put away reading materials and get ready for math. You need to send something to the office. You receive an emergency phone call. That’s when I’ll help you out. Put me on your interactive white board and I will sing, dance, entertain your class – and perhaps help them learn something! So, I need your help! I’m going to record a new DVD in a few months and I'd like your suggestions for songs that I should include. Of course, I’ll do the “Tooty Ta” and “The Cool Bear Hunt” on this recording. But what else would you like? Let me know your suggestions in the next two weeks and I’ll aim to please. You might even use this as an opportunity for your students to write an “opinion” about their favorite song. You can email your suggestions to drjean@drjean.org. Thanks for your help! BRING AND BRAG OR SHOW AND SHARE??? One of the enduring rituals in early childhood has been sharing time. Most children love to be the center of attention and talk in front of their friends. However, you can reinforce important speaking and listening standards with some of these ideas. Show and Share - Instead of “bring and brag,” focus show and tell on a specific theme you are studying, such as a letter, science concept, shape, etc. *Provide a child-size podium (old music stand) for children to stand behind when they speak. *Have children close their eyes as friends take turns sharing. Can everyone remember one thing at the end of sharing time? *Ask children to come up with three clues about what they have brought from home. (Parents could write these for young students.) After giving the clues, friends try and guess what it is. *Let the class ask 20 questions about show and tell items. Tally their answers on the board. *The person sharing can make three statements about what they have brought. The class then gets to ask them three questions about it. *Try “show what you know” where children can demonstrate what they have learned about a theme. They could do an art project, make up a song, do a skit, make a video, etc. Hint! Designate a special shelf or table in your classroom where students can place their show and tell objects for friends to look at later in the day. Assign students different days of the week for sharing time. Our grandson had a birthday recently and our daughter came up with a unique solution to all the toys. There is a site (echoage.com) that provides a balance between something for the birthday child and helping a charity of their choice. K.J. was able to donate money to a camp for injured animals and get the video game of his “dreams.” (What can I say?) I’m sure the parents of the children who were invited were thrilled to donate online instead of buying a gift, wrapping it, yada yada. 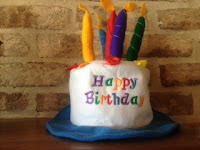 If you’ve never seen my “birthday video” you can check it out to see how we celebrated in my classroom. write the letters that they know? they find on the bags and boxes. Directions: Put sticky dots on the Unifix cubes. Write letters on the dots. or write a sentence using the singular and plural form? and number them. For example: 1. dog, 2. rat, 3. pig, 4. bus, 5. More! Use more challenging pictures and words for older students. Directions: Have children sort the coins that are alike. Which one has the greatest amount? Smallest amount? each one. (Vary the amount to the counting ability.) Children count out the appropriate number of coins for each object. write down the page number on which that word can be found. letter to make it look like something else. More! Challenge children to create an object out of the letter that begins with that sound. Directions: Have the children sort the cards by suit. Can they put the cards in order from 1-10? More! Write “high,” “low,” and “equal” on a piece of paper as shown. classroom and write words they can read. Make a book of nouns, color words, shapes, adjectives, etc. You can buy clipboards or make your own from corrugated cardboard and butterfly clips. Here are a few quick and easy centers you can do with clipboards. list. They can cross through the words as they find them. Hint! A pair of empty glass frames makes this more fun. of paper. Can children find a word in the room for each letter? “outside”; “big” and “little”; “real” and “pretend” etc. 2 letter words in the second section, etc. More! Write one syllable words, two syllable words, etc. Directions: Children look out the window and describe what they see. After writing, they can illustrate their observations. their response on the line. Directions: Purchase play dough or make your own using the recipe below. over the lines on top of sheet protector. Have children make three-dimensional shapes with play dough. Directions: Children “pick” a letter or word from the pail and type it. can type in five minutes. Directions: Choose several books by one of the children’s favorite authors. 1. The author of these books is__________. 2. My favorite book is__________. 3. The funniest picture is__________. 4. The book about a bully is_________. 5. The book about a party is_________. 6. I wish the author would write another book about____. Directions: You could prepare the shapes ahead of time or let children trace around patterns and cut them out. 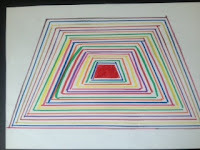 Children arrange the shapes on a sheet of paper to make new designs and objects. Can they identify the shapes they used? Encourage them to give a title to their artwork. for five things they see in the picture. are saying. What happened before? What will happen next? they will be completing the puzzle. TOUCH, TELL, AND I "TIN"
and then write a description of what they think is in the sock. students so they can write down what they think is in each sock. children to make all the words they can with the letters. Directions: Make a very small shape (triangle, square, trapezoid, half-circle, etc.) in the center of the paper. Children take a different color of crayon and go around it, making it a little larger. 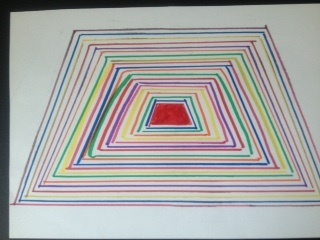 Continue using different colors of crayons and making the object a little larger until it completely fills the page. Hint! You could prepare these ahead or let the children create their own small shapes in the middle of the paper. the book that would answer each question. the yarn. Tie the ends and wear like a necklace. More! Children can make necklaces using the letters in their name, their initials, vocabulary words, etc. Directions: Draw a line down the middle of a bag with a permanent marker. Do you need a little “BAM” in your classroom right now? 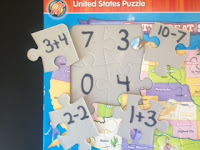 Every day this coming week on my blog you’ll find simple (and inexpensive) learning centers that you can create. My goal was to come up with centers that would engage children and that teachers could make in less than 15 minutes. One of the best things about learning centers is that you can integrate Core Standards with 21st Century Skills. As children practice cognitive skills they will also be collaborating, communicating, problem-solving - and developing the executive function (task initiation, self-regulation, delayed gratification)! Win! Win! Win! *Use these centers for independent, small group, or take home activities. These could also be available for students who finish their work early. *Store centers in zip bags, manila envelopes, pencil boxes, plastic tubs, baskets, etc. Hint! Color code with stickers to indicate content area and standard. *”Invite” parents to be game makers and collect the materials and put the centers together for you. *Share centers and rotate them with other teachers. If there are 4 teachers on your grade level and you each made five, then you could rotate them a week in each class. You’ve got centers for a month! *Number centers 1-5 and ask children to do one each day. You could also put a checklist with each center so children could cross through their name when they complete an activity. *Adapt these games to specific skills and the needs of your students. For example, with “In the News” pre-k children could highlight letters. Kindergarten children could highlight word wall words. First graders could find nouns or verbs. Second graders could find a word for each letter of the alphabet and write them in alphabetical order. the words (or letters) on a sheet of paper. numbers on the key pad that match the letters. Children write down the numbers and then add them up. Hint! Write the answer under the lid of the envelope. or four letter word for first, and so forth. would you like to ask your puppet? More! Have students write a story about their puppets. HOW ABOUT A POTATO HANDSHAKE? SAME SONG - NEW VERSE! WOULD YOU LIKE A MAGIC WAND?